Harvard has been working on insect-inspired robots for years, with its at-scale robotic bees project attracting a lot of attention. In yet another breakthrough, the team of researchers recently added swimming functionality to the robotic bee, creating the first ever flying and swimming capable, flapping-wing, insect-like robot. This achievement was presented this week at at IROS (IEEE Robotics & Automation Society) 2015, reports IEEE Spectrum. Putting it into scale, the robo-bee is a life-sized robotic version of a bee equipped with an antenna, airfoil wings, an electronic nervous system, and both pollinating and docking appendages. The bee is capable of hovering and directed fight using built-in optical flow and UV targeting sensors. And now with no hardware modifications at all, the bee can swim. Swimming underwater is the same basic motion as flying through the air, so the Harvard team only had to make minor adjustments to add this feature to their robotic bees. The biggest change is how the bee flaps its wings. When flying, the bee flaps its wings at 120 Hz, but while swimming it slows down its movement to 9 Hz. The controls while swimming under the water are similar to flying in the air, allowing the bee to steer as it moves beneath the surface. While swimming might be easy, the transition between the air and water is an ongoing issue the team is still trying to solve. One of the problems is the bee’s small body size and lightweight frame. It’s so small that it cannot easily break through the surface tension of the water, which means it floats great on top of the water, but struggles to sink down and swim. To enter the water, the bee has to ascend into a dive, crash land on the surface and then sink underneath the surface before it can swim. The team has used a surfactant on the wings to help the bee sink, but it is still a challenge. The bee experiences a similar issue when attempting to exit the water. It takes an extra burst of power propel out of the water and transition into the air, which is tough. The initial flight also is a challenge as its wings are still covered in water. These beads of water change the flight dynamics of the robot and makes the bee unstable, especially in a hover. The water works its way off the wings eventually, but these first few moments can be dicey. Despite its hurdles, the team at Harvard is making great strides with this multi-modal robot and hopes to refine its water and air locomotion. 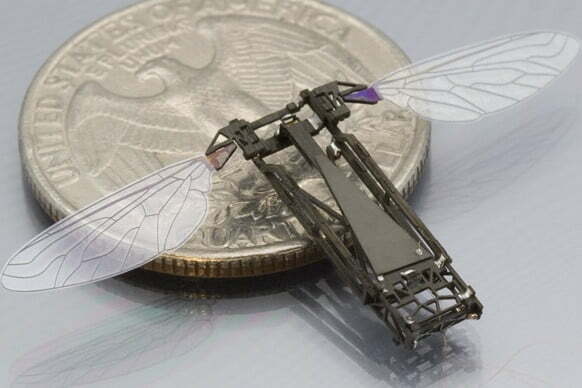 As with most other robotic insects, the robo-bee is designed for agricultural, commercial and especially military applications, where a flying and swimming robot could be beneficial.